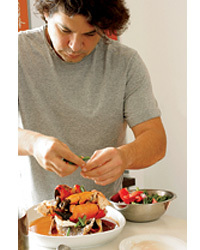 Star chef Gastón Acurio is determined to export his country’s best dishes to the rest of the planet. Writer Adam Sachs inquires about his global ambitions. Not many chefs can look at a grilled, skewered cow’s heart and imagine a global snack trend in the making. But Gastón Acurio sees potential in anticuchos, the multiple kinds of spicy-tender marinated meats that are grilled and served from smoky carts by little old ladies in white hats. In exporting Lima’s street-food staple to the world, he also envisions a way of elevating the status of Peruvian cuisine internationally. At 41, Acurio is a celebrity throughout South America, a constant presence on Peruvian TV, the author of nearly a dozen cookbooks and the owner of 14 restaurants in Lima alone. “Our mission isn’t just making restaurants,” Acurio tells me as we head to the construction site of a new venture, Panchita, an upscale anticucho place in Lima’s wealthy Miraflores neighborhood. “What we’re doing, really, is selling a country.” To that bold end, Acurio and his team develop all his restaurants as models that they can test locally, then open in as many cities as possible. Besides his signature, high-end Astrid y Gastón and the big, fun, popular cevicheria La Mar, he owns a chain of sangucherías (Peruvian sandwich shops) and a playful, Peruvianized modern juice bar called La Pepa. 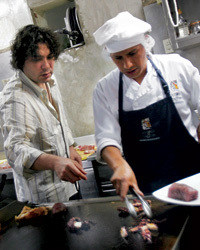 He has successful restaurants in Caracas, Venezuela; Panama City, Panama; Mexico City; and Madrid. An Astrid y Gastón is set to open in Buenos Aires in December. Acurio also has ambitions in the United States, where Peruvian food has never found a crossover audience. In September he debuted his first major North American project, an outpost of La Mar at San Francisco’s Pier 1.5, next to the Ferry Building. Early next year, Dallas will get a version of  T’anta, a restaurant/take-out store that resembles a South American–themed Dean & Deluca. I ask Acurio to imagine he is standing outside La Mar in San Francisco. What would he say to lure in passersby to try an unfamiliar menu? “For sure, I would be there with a big plate of ceviche: ‘Taste this! Taste!’” he says. Ceviche is the gateway to Peruvian food and the country’s most recognizable, accessible dish, as well as something of a national obsession; there are, says Acurio, 2,000 cevicherias in Lima. Thanks to sushi, Americans are comfortable with raw fish, so it makes sense that ceviche would be at the heart of Acurio’s first Stateside push—and that it would come in San Francisco, a city, he notes, that likes to eat. He serves seven kinds of ceviche representing Peru’s various culinary traditions, from Clásico (halibut spiked with habaneros, corn and yams) to a Japanese-inflected ceviche that combines ahi tuna, avocado, nori and sugarcane. There will also be a large pisco bar. “With a pisco sour in one hand and ceviche in the other, I think I can convince everybody,” the chef says. Acurio’s most immediate concern, though, is the upcoming Panchita in Lima. “This is like a fantasy island of anticuchos,” he tells me on a walk-through of the huge, half-built space. “Here we’ll have a showcase, almost like a jewelry shop, of amazing, grilled-to-perfection meats, octopus, shrimp.” Beyond elevating street food, Panchita is helping Acurio make a claim for the individuality of the Peruvian grill. “Argentina has its steak; Brazilians, they have rodizio. Peruvians make anticuchos,” the chef says, noting that the difference is ají amarillo—chiles that give anticucho marinades their spice and are a building block of nearly all Peruvian dishes. Acurio points to the spot where the wood ovens will produce side dishes made from what he calls “the universe of Peruvian potatoes” (there are literally thousands of varieties grown in Peru). “For $18, you’ll be able to have all you want of 25 kinds of anticuchos,” Acurio says. Nobody will ever leave, I suggest. “That’s the idea,” he says, smiling. Without quite forgiving him, Acurio’s father agreed to fund his further education in Paris on the condition that he come back and work in Peru when he was done. In Paris, he met and married Astrid, a German pastry chef. In 1994, Acurio returned to Lima with “no money, no job, a pregnant wife and an angry father.” The couple opened Astrid y Gastón with $45,000 borrowed from friends and family. (“Now, the new bathrooms in the restaurant cost $45,000,” he notes.) When it opened, Astrid y Gastón served, naturally, French food. “We were packed from the first day,” Acurio says now. “But we weren’t happy. A Peruvian chef making French food in Peru—it means nothing.” Gradually, Acurio added homegrown spices and techniques to his menu. “In 1995, I put ají in my beef stew; in 1996 I listed the first ceviche and tiradito [Peru’s carpaccio-like fish dish] on the menu. By 1999 I had realized Astrid y Gastón wasn’t a French restaurant anymore, it was Peruvian, so I took all the butter and cream out of my kitchen. Now, there is just one French restaurant in Peru.” In a sign of Peruvian food’s growing cachet abroad, young chefs from Spain and France have been appearing at Acurio’s kitchen doors in Lima, asking for work. As we toured Lima, eating three lunches and two dinners a day, it became clear why Acurio views his country’s food as a near-limitless source of inspiration. First, there’s Peru’s size and geographic diversity. From the Andes mountains and the Amazon rain forest to the long coastline, the country’s contours have shaped its regional cuisines. Acurio describes the differences this way: “In the south, the food is red from the rocoto; in Lima, it’s yellow because of ají amarillo; and up north, it’s green from cilantro.” In the Andean city Cuzco, locals eat roasted cuy (guinea pig), while people in Lima prefer roasted chicken. We ate early fusion cuisines like Nikkei, created by the Japanese workers who came in the early 20th century and stayed. “The Japanese added a lot to Peruvian cuisine,” Acurio says. “We used to marinate ceviche for eight hours—we really cooked it.” Now, cevicherias marinate fish for 30 seconds to a few minutes. At a Criollo restaurant, El Rincón Que No Conoces, we tasted the rich tripe stews and beans of the African- and Spanish-influenced black Peruvians. At Fiesta, we sampled modern takes on the food of the northern Moche culture. “My friend looks like a Moche king,” Acurio said of the chef, who made a “hot ceviche” of cured grouper wrapped in corn husk and grilled quickly over a wood fire. The most interesting place Acurio took me—and the one most indicative of his mission—wasn’t a restaurant. On my final morning in Lima, we drove an hour-and-a-half north of the city to a shantytown called Pachacutec, where wild dogs stood in the dirt road. After the corrugated metal houses faded away, we came to a few new, single-story brick buildings near the ocean. This is the world’s most unlikely cooking school, co-sponsored by Acurio; each day, kids walk miles to learn a trade that they hope will take them away from Pachacutec. In a well-lit room, serious young students whipped up elaborate puddings and fried donuts. They fed me and thanked me for visiting. It was an uplifting place and a reminder that change depends on providing an education you can’t get from cooking shows.